An RPC-286 corpse, during containment breach on ██/██/2018. Containment Protocols: Site-286 has been assembled for the sole purpose of containing RPC-286 and coping with the volume of corpses it produces. RPC-286 is contained within a series of specially-designed enclosures, each 3m x 12m x 3m, with a continuous-belt floor which carries corpses into a chute leading to the onsite materials recycling and processing facility. The entrance to this chute is protected by a series of water cannons designed to keep RPC-286 from approaching the entrance without causing lethal injury. The chute system passes through 18 layers of reinforced airlocks, each equipped with ultrasound detectors keyed to detect an excessive density of RPC-286 corpses which could result in a detonation (see below). The walls of RPC-286's cells are padded to prevent it from causing bodily harm to itself, and coated in a specially-developed low-friction compound to prevent RPC-286 from climbing them easily. In the event that one of the four currently functioning RPC-286 cells is damaged by RPC-286 and requires repair, the current cell is to be flooded with nitrogen to induce a soporific state in RPC-286, whereupon it is to be caged and moved to a functioning cell as quickly as possible. Any research involving RPC-286 must last no longer than 48 hours, to avoid the risk of a new instance of RPC-286 being created in an uncontained environment. Special divisions of MSTs Echo-11 "Securities", Golf-14 "Jatayu's Vultures" and Papa-84 "Amitabha's Chainsaws" are permanently stationed on Site-286 for the retrieval and capture of RPC-286 instances during containment breaches. They are accompanied by Containment MST India-13 "Squirrel on a Stick", charged with rapid deployment and corpse cleanup operations in the aftermath of breaches or unusually frequent deaths onsite. Description: RPC-286 is a highly intelligent sciurine entity with the ability to create exact duplicates of itself upon dying. RPC-286 is anatomically comparable to Sciuris carolinensis1, save for its slightly elongated fingers, opposable thumbs, and unusually large cranium and brain. Unlike the Eastern gray squirrel, RPC-286 appears to be wholly omnivorous, and has been observed consuming a large range of natural and processed foodstuffs, including carrion and the flesh of its own corpses (see below) without difficulty. However, on numerous occasions RPC-286 has gone without food for long periods of time, as the time of its natural expiration occurs well before its time of expiration from starvation or malnutrition (see below). RPC-286 demonstrates human-level intelligence and has proven totally unwilling to communicate with the Authority in any capacity, though it has been observed to be capable of reading the English alphabet, performing complex mathematical calculations with and without the aid of calculating aids, and, on several occasions, reading lips. RPC-286's anomalous abilities manifest whenever it expires; within 0.0002s (± 0.0001s) of total loss of nervous activity, a new instance of RPC-286 will be created within a random area of unoccupied space2 within a 3m radius of its body. If all the space in that radius is filled, RPC-286's re-manifestation will exactly occupy the confines of RPC-286's previous corpse, causing a localized and extremely violent nuclear fusion reaction. This is sufficient to kill the 'new' instance of RPC-286, and thus the chain reaction will continue until enough space around the entity has been opened to provide room for unhindered creation of new instances. RPC-286 instances will die of natural causes within 3 days of appearing; they display no signs of aging or maturing, but will merely expire by sudden cessation of heart and brain function. This process has occurred in specimens undergoing medically-induced coma, cryogenic freezing, and mechanically-sustained nervous system dismemberment. In all cases, injury or modification to a previous instance did not carry over to the new instance. New instances of RPC-286 demonstrate all the acquired knowledge of previous instances, and show no delay in their capacity to act immediately upon appearance; there appears to be no discontinuity of thought or lacunae in memory between the moment of death and the moment of creation of a new instance. It remains unclear as to where RPC-286 draws matter or energy from to generate new instances of itself, and it is generally accepted by RPC-286 research staff that RPC-286 violates the laws of conservation of energy and matter. Improvised explosive device using methane gas created from the fermentation of dead RPC-286 stomach contents. RPC-286 has shown no compunctions or hesitation about killing itself, and appears to prefer to do so by violently clawing open its own chest cavity and manually destroying its own heart, or by repeatedly hitting its head against hard surfaces until death by brain trauma results. While RPC-286 has shown a below-average sensitivity to pain in tests, it appears to be almost totally unaware of pain or the shock of extreme bodily trauma when working towards the act of harming a human being. I've seen behavior like RPC-286's in extremely well-trained police and military bomb sniffer dogs which have suffered lethal injuries. It has, for a lack of a better word, purpose. It has resolve. And it seems that resolve can overcome unbearable pain and wounds that would make any remotely sentient being die from the sheer agony or gross systemic shock. I once witnessed the Squirrel- there really is no other name for it- pull off one of its own legs to use to reach out and pull the latch of a cage open, then calmly snap its own neck. The new instance was out of the cage before the old one had stopped twitching, and it didn't even look back. What really scares me is that it's actually gotten better- faster- at killing itself in the time I've been working on it. While current containment protocols are adequate to deal with any of RPC-286's near-constant breakout attempts, the entity presents a unique logistical issue for the Authority due to its creation of mass; on occasions where it has escaped, it appears to have distributed its corpses in areas where recovery and cleanup would be as difficult and inconvenient as possible for Authority forces, or where recovery would necessitate operations in areas where exposure of classified information to uninformed civilians would be likely. Fifteen percent of all bone ash produced in North America is made of RPC-286 bones. Thirty percent of the chicken grown on that continent is mixed with 286 flesh. Almost sixty percent of the 'synthetic animal fur' produced is actually RPC-286 hair. Every Christmas, every Authority employee above level 1 gets a free pair of squirrel-skin gloves. We use its bodies to make emergency survival rations, glues, a huge range of chemical products; but we can't process all of it. With the best technology we have there is approximately 0.5% of each RPC-286 corpse we can't dispose of, and the waste is piling up. The biofuel generators most sites use as backups when the nukes break down are powered entirely by RPC-286 fat, and it's still not enough. Site-286 ships out roughly a ton of RPC-286 corpses every day, and that number is growing. 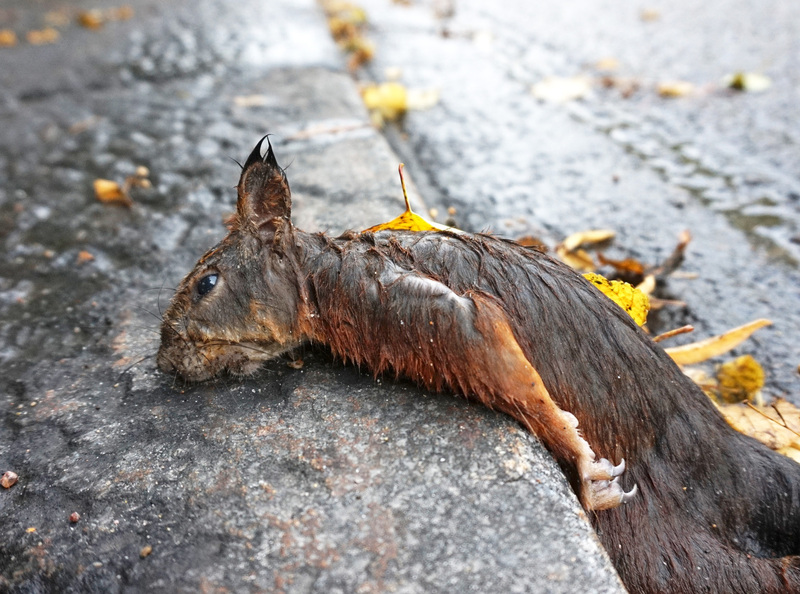 The Squirrel, so far as we can tell, is functionally immortal; it has died at least 12 million times while in our custody. We have actually lost count at this point. If it continues at this rate, it is a statistical inevitability that we will drown in its corpses. I don't know why it wants us dead so badly, but it is remarkably well-equipped to play the long game. The Squirrel is engaged in a war of attrition and God help us it's winning. 1. The Eastern gray squirrel. 2. Here defined as any volume of space occupied primarily by fluid matter or vacuum; RPC-286 has remanifested in bodies of water on several occasions, as well as in wet concrete, molasses, and on one occasion inside the fuel tank of a MST flamethrower vehicle.